He described one classmate who had to invest $5 million a day. Which was sort of a ticking time bomb — if he only got $4 million invested one day, then he had to place $6 million the next. It was insanely stressful work, done among unpleasant, backstabbing coworkers. 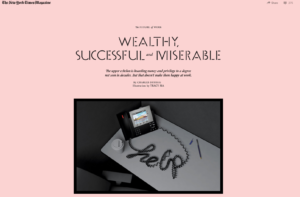 He was paid well — about $1.2 million a year — but hated going to the office. Jobs that make the world better. Jobs that are more or less neutral in their effect. Jobs that make the world worse. Presumably, jobs in that last category should be earnestly avoided — at least by those looking for meaning and/or morality in their work. 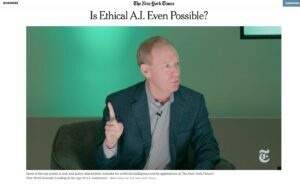 Just a few days later, the NY Times ran a rather different article, “Is Ethical A.I. Even Possible?” It chronicled the challenges that corporations, and their employees, face as they grapple with how to develop new AI capabilities that are not ethically suspect. The article made clear that the drive for profits necessarily pulled companies toward dubious applications. Against which, there seem to be only two bulwarks: government regulation and employee sentiment. The article profiled the struggle around ethical AI at Clarifai, a small NY company focused on facial recognition and related applications. Some employees had grown increasingly concerned that their work “would end up feeding automated warfare or mass surveillance.” In late January they posted an open letter on a company message board asking CEO Matt Zeiler where their work was headed. Zeiler then held an all-hands meeting at which he made clear that the company’s technology was likely to end up in autonomous weapons. He also reversed course on the need for an AI ethics officer, saying such a position was unnecessary at a small company. In turn, the employee who had drafted the open letter to Zeiler left the company. Interestingly, Google worked on the same Pentagon project as Clarifai — but after a protest from company employees, the tech giant ultimately ended its involvement. And after Amazon employees protested the sale of facial recognition services to police departments, Amazon (and Microsoft) called for government regulation. The article also noted that thousands of AI researchers from across the industry have signed an open letter saying they will oppose autonomous weapons. In turn, Meredith Whittaker, a Google employee and co-founder of the AI Now Institute, a research institute that examines the social implications of artificial intelligence, said this is an especially auspicious time for tech employees to use their power to drive change. Why all the ferment? Two reasons. First, today’s employees have grown up with the understanding that many of their activities — from consumer purchases to stock investing — have important moral dimensions. A decision to buy a piece of apparel, if it was sourced from slave labor, or to invest in a company that does serious harm to the environment, are necessarily moral choices. Similarly, a decision about where to work is — for those privileged to have choices — a fundamentally moral determination. One might argue, in fact, that owning a shirt or a stock is a form of passive complicity. But a decision to work for a company is a more active and important commitment — one in which the employee is expected to diligently further the aims of his or her employer. Which means such a commitment necessarily has substantial moral ramifications. Second, AI is entirely reshaping the tech (and business) landscape. Companies like Amazon, Facebook, Google, and Microsoft are facing growing unrest from employees, and potential recruits, about the ethics challenges of their business models. Tech workers have signed open letters opposing Google’s Project Maven contract with the U.S. military, Microsoft’s contract for U.S. Immigration and Customs Enforcement (ICE), and Amazon’s sale of facial recognition technology to law enforcement. Almost always, the underlying issue is an application of AI that employees consider dangerous and undemocratic. Artificial intelligence has upped the potential for harm from the business models of more and more companies. But it has also created a new class of workers — ones who can meaningfully ‘vote with their feet’ against profits that put society at risk. Thankfully, more and more employees are casting their votes.